Suzy Lou with her beautiful wooden ceiling beams overlooking the knotty pine walls provide the real cabin feel you expect from a mountain cabin on a lake. The open floor plan equipped with all the comforts of a modern home ensure your friends and family will adapt to "cabin life on the lake." Strategically located on a secluded, peaceful shoreline of beautiful Norris Lake, Suzy Lou provides the best of all worlds. 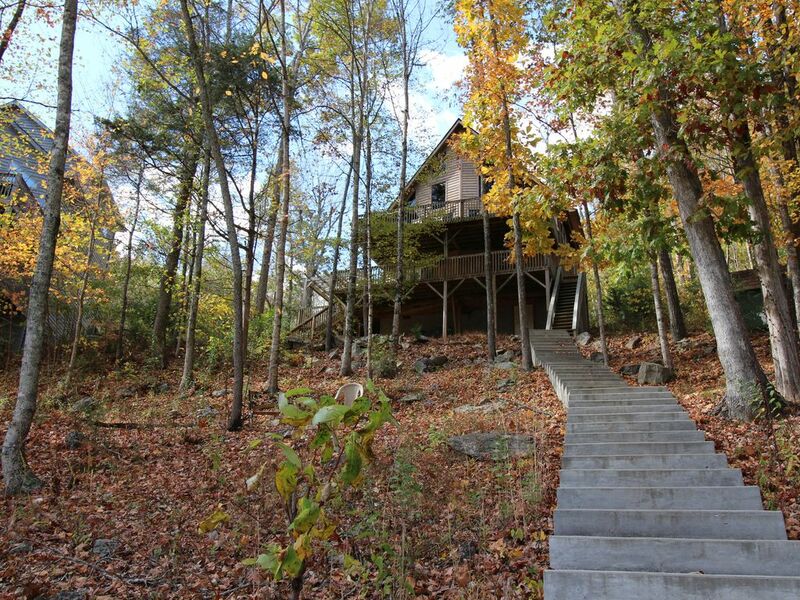 This cute, 5 bedroom cabin provides plenty of room for friends & family. Take the unbelievably easy walk to your private dock located in a sheltered swimming area of Norris Lake. There, you will enjoy the pristine waters of Tennessee's cleanest lake. Grab your kayak, or paddle board and stroll around the acres upon acres of no wake, protected water. When the time is right, cruise past Flat Hollow to enjoy endless miles of uncrowded ski water. They say 'location' means everything. "Suzy Lou" is 15 minutes from LaFollette, 10 minutes from the main road, inside a private community, nestled in trees, right on the water's edge. Large TV room on main floor. Additional TV room on lower level. Please NOTE: this cabin was not built for wheel chair access. However the Main Level is street level with no steps required to enter cabin. Please call for details. Suzy Lou cabin at Norris Lake is the perfect place to gather with your friends and family with plenty of space and things to do. Please call us for suggestions on golf, boat rental, restaurants, bedroom details, etc. We are here to assist you. Suzy Lou is clean & had all the essentials for our large group. Plenty of space for everyone- nice to have a 2nd living space. I do wish the view to the lake was more open, it is obstructed by trees. Suzy Lou does have several steps - it was not problematic for us- we made sure we had everything with before heading down. We thoroughly enjoyed our stay- Norris Lake is absolutely gorgeous! Rustic lake house. Large and comfortable. Lake was great fun. We had a great time with our children, their spouses and our 4 grand children. There was plenty of room and the sleeping arrangements were very nice. The House was rustic. From the two spacious decks you could view the lake below. The dock with paddle boat was great for swimming. The property manager,John, was very attentive to our needs-from the time made our reservation through our stay. If you stay at Susie Lou, you’ll have a great vacation. We enjoyed our stay at SuzyLou on Norris Lake. We knew the unit was more of a summer property but still enjoyed the beauty of the area in the winter. The area is remote but we enjoyed not trotting here and there to take in other attractions. The owner was very responsive to a heat issue and went above and beyond to make sure we were comfortable during our stay. The house had plenty of room for the seven of us during our week stay at Norris Lake. Nice to have a dock to pull up to at the end of a fun day on the water. Walk up from the water was just about right. Setting for home is very pleasant. House was stocked pretty well. Owner responsive to questions during stay. Great View! Great Condition! Loved it! We were a big group, and we were able to find everything that we needed!!! It was what we wanted, a real kabin...We had a great time!!! !